Pretzels are my favorite snack. They come in all types of sizes and shapes. Some say that a pretzel was invented invented pretzels to reward kids who behave really good and learn their prayers. Some also say that pretzels were invented by a bunch of bakers held hostage. This standard pretzel shape shown in the picture is used to represent the hands in the prayer and the three holes in the pretzel represent the holy trinity. These holes were also convenient because they could easily be hanged up. During this time pretzels were considered a sign of goodluck. Many Pennsylvanians make S shaped pretzels. These represent the s of Philadelphia. Nowadays, they usually come in the shape shown above, stick shape or loop shape. Pretzels have many different toppings. For example, in Europe the pretzels are sometimes sprinkled with salt, cheese or poppy seeds. In Japan, they have a variation of a pretzel called pretz and it is in the form of a stick. Pretz have many different flavors such as green salad, chocolate or even strawberry. Most pretzels are baked with lye or washing soda. The names of a pretzel in Germany may includ Bereze, Brezn, Bretzel, Brezzl, Brezgen, Bretzga, Bretzet, Bretschl, Kringel, Silserli, and Sülzerli. 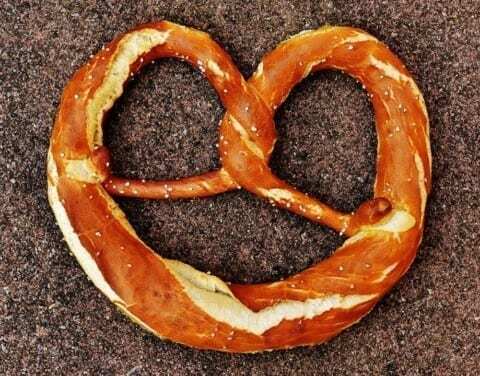 Pennsylvanians eat almost 80% of all pretzels. German immigrants in Pennsylvania made a pretzel factory in 1980. Till the 1930s, pretzels were always baked by hand until 1935, when they created the first automated pretzel maker. The guy who created the first pretzel factory (his name was sturgis) claimed to invent the first hard pretzel which were even more popular than the soft ones! Once when Turks tried to invade Russia, the Monks baking pretzels in the monastery heard them and told the empire. They got reinforcements and defeated them. They were rewarded with a coat of arms. History of Pretzels by Kai is licensed under a Creative Commons Attribution-ShareAlike 4.0 International License. Why social media has changed our image?How Are Genes and Sports Related?